Against the Tide. I repeat: Against the Tide. I find myself, on occasion, asking, “Why did I entitle this blog, “Against the Tide”? When I face the daily challenges of church leadership, it doesn’t take long to remember. When I confer with other pastors and the challenges they have faced, it doesn’t take long. When I mentor church planters and the challenges they will face, it doesn’t take long. I have recently been blessed with the privilege of sharing a trip to Turkey with six other pastors. We were the guests of the Maryland American Turkish Inhabitants organization, a local expression of the Gulen Movement in which cultural and interfaith dialogue is being encouraged between moderate Muslims and Americans in order to engender international peace. Without becoming the boring vacationer with lots of slides that no one really want to see, indulge me a moment to write about Ephesus. For a week we met with groups of educated, professional Muslims for food, fellowship and conversation. We ate outdoors, indoors, in restaurants, business cafeterias, school cafeterias, school meeting rooms and in homes. At times we felt like the fatted calf, we were so well fed. 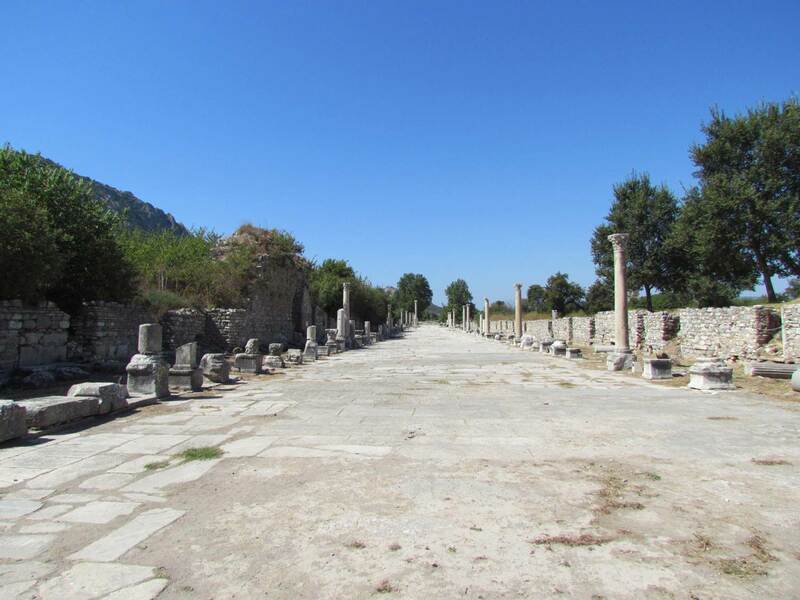 As a further expression of their desire for a peaceful coexistence, we were treated to sites important to Muslims, historians, educators, journalists, Christians and tourists, among which was Ephesus. While I could, and probably eventually will, write about Cappadocia, Istanbul and Haran (where we were just ten miles from Syria), Ephesus serves the greater purpose today. In archeological terms the site is relatively recent. That explains the extent of preservation. In fact, they were digging while we were there and will be doing so for the balance of our lifetimes. Having wandered from the top through the ancient streets and columns we wound our way to the bottom and a great amphitheater that faced a wide street leading to nowhere. That’s what it looked like. While it could be assumed that the “end of the road” was merely the “beginning of the road” leading into town, it was not. In the days of Paul the road ended at a harbor, the kind with ships and water. Now, the Aegean Sea is more than three miles removed. An unrelenting and, at times, imperceptible march of resistance. A combination of erosion from the top and sedimentary deposits from the tides at the bottom resulted in a road to nowhere. A scourge of Christian history is the failure of spiritual leaders to recognize and respond to the seemingly imperceptible cause of decline and demise. Success has always been the result of resistance to the unrelenting tides which do not stop and can carry you away into nonexistence. Not a single church that was planted in Asia Minor (Turkey) remains. Kingdom work will always be against the tide. If you’re a fighter by nature, you may be church planting and/or church leadership material. All of the accolades, admiring glances, pats on the back and invitations to heady events are often offered as though you are a genius who somehow figured it all out. No one rarely recognized the hard fought inches and ounces of progress that were required to get there. As blessed as our journey of church planting and growth has been because of the miracles accomplished by the Spirit, it has been as roses among thorns. Paul’s “we wrestle not” is not a summary statement about Easy Street. It is about spiritual tides that never cease, powered by the dark forces of the enemies of God. My advice? Don’t enter the water unless you are prepared to swim against the tide until Jesus returns.